There are a few options when it comes to choosing a pool fence color. The color brown signifies stability, warmth, and quality and Katchakid’s premium powdered-coated pool fencing is available in three sensational shades of brown. These color tones blend organically with your backyards landscape and subtly enhance the natural environment. Powder coating gives the Katchakid fence poles a layer of skin that is almost double the thickness of liquid paint, meaning a higher resistance to chipping, flaking, scratches and cracking. 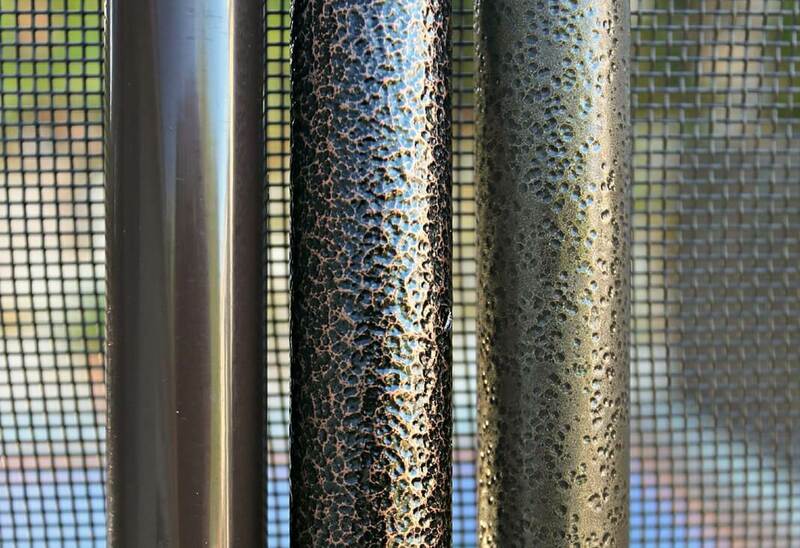 The powder coating mixture, composed of finely ground particles of pigment and resin, is electrostatically sprayed onto the surface of the aluminum fence poles as a dry powder. The poles are then placed into a curing oven where continuously applied heat fuses the powder into a smooth seam-free film. The final result is a uniform, attractive and durable superior paint finish. What Is Hammer Tone Texture Powder Coating? The hammer tone is an advanced type of powder coating providing a highly stylized and decorative protective finish. The stippled surface creates a beautiful illusion of depth and texture that compliments any backyard. This specialty paint finish is one of the most enduring of the paint finishes and allows the color hues to stay vivid and true longer.